LondonHouse Chicago, Curio Collection by Hilton features a full-service spa and a 24-hour fitness center. Dining is available at one of the hotel's 2 restaurants. The property also offers a grocery/convenience store. Guests can unwind with a drink at one of the hotel's 2 bars/lounges. Public areas are equipped with complimentary wireless Internet access. Business-related amenities at this 4.5-star property consist of a business center and meeting rooms. Event facilities measuring 25000 square feet (2323 square meters) include conference space. This luxury hotel also offers spa services, a terrace, and multilingual staff. Parking is available onsite for a surcharge. A total renovation of this property was completed in 2016. LondonHouse Chicago, Curio Collection by Hilton is a smoke-free property. 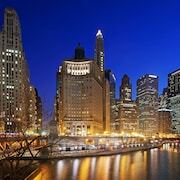 Located in The Loop, this luxury hotel is within a 5-minute walk of Chicago Riverwalk and Chicago Theatre. Michigan Avenue and House of Blues Chicago are also within 10 minutes. Randolph-Wabash Station is 5 minutes by foot and State Station is 5 minutes. 2 restaurants, a full-service spa, and 2 bars/lounges are available at this smoke-free hotel. WiFi in public areas is free. Additionally, a 24-hour fitness center, valet parking, and massage/treatment rooms are onsite. All 452 rooms feature thoughtful touches like bathrobes and slippers, plus free WiFi and LED TVs with first-run movies. Other amenities available to guests include MP3 docks, refrigerators, and room service. LondonHouse Chicago, Curio Collection by Hilton offers 452 air-conditioned accommodations with MP3 docking stations and laptop-compatible safes. Beds feature Frette Italian sheets and premium bedding. 55-inch LED televisions come with first-run movies and pay movies. Bathrooms include bathtubs or showers with rainfall showerheads, bathrobes, slippers, and designer toiletries. This Chicago hotel provides complimentary wireless Internet access. Business-friendly amenities include safes and phones. In-room massages and hypo-allergenic bedding can be requested. A nightly turndown service is provided and housekeeping is offered daily. Bridges - This cocktail bar specializes in American cuisine and serves breakfast, lunch, dinner, and light fare. Guests can enjoy drinks at the bar. Open daily. LH22 - This rooftop bar serves light fare only. Open select days.